Polyurethane Tube Manufacturer - Ama Husain & Co. Available from 38 mm to 1000 mm dia. in 4 to 10 Mtr. 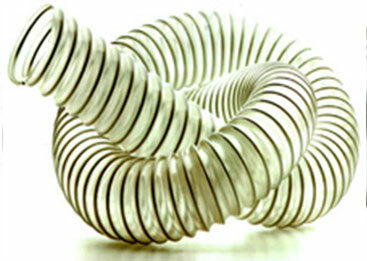 Lengths made with continuous PVC Coated Steel Wire / PVC Wire / Spring Steel Wire reinforcement Helix between PU film overlap. Crystal clear glass like appearance for visual product control. No adhesive or hot melt used in construction, no plasticisers. Good chemical resistance, including certain oils. Superb tear strength. These are durable, light weight and designed for maximum air flow. Toxic Liquids & All pressure application.